Tokyo Tech researchers show dendrimers that mimic the electron valency of atoms can also mimic polymerisation yielding controlled one and two-dimensional arrays of nanocontainers. In nanotechnology control is key. Control over the arrangements and distances between nanoparticles can allow tailored interaction strengths so that properties can be harnessed in devices such as plasmonic sensors. 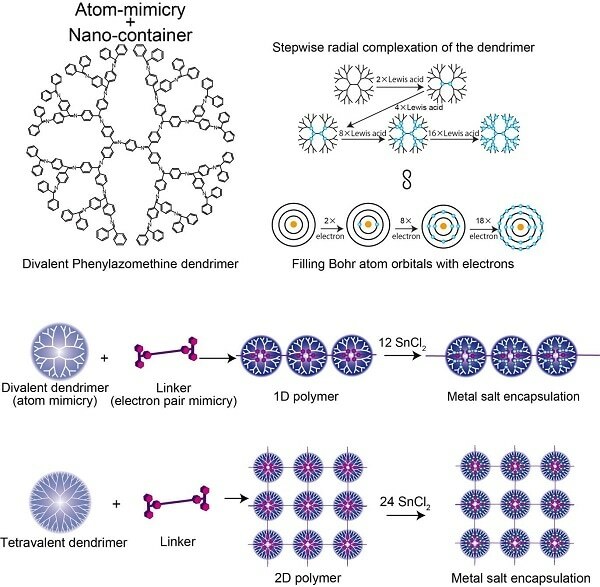 Now researchers at Tokyo Institute of Technology use dendrimers that mimic the electron valency of atoms and link them into arrays using molecules that coordinate with the dendrimer as they would form a covalent electron pair in their valence shell – “electron pair mimicry”. Kimihisa Yamamoto, Ken Albrecht, and colleagues at Tokyo Tech considered the dendritic polyphenylazomethine (DPA), which has a structure that branches out from a central core. “Lewis acid” molecules coordinate to the “Lewis base” sites of DPA. Analysis of the ratio of SnCl2 Lewis acid molecules coordinating with each dendrimer revealed step increases from 2 to 4 to 8 to 16, which mimics the valency of the Bohr atom that has 2, 8, 18, and 32 electrons in the 1st, 2nd, 3rd , and 4th orbitals. This reflects the increase in the number of molecules that can coordinate with the dendrimer with increasing distance from the core, as the number of dendrimer branches and electron density increases. Yamamoto’s team analysed the coordination of DPA with a stronger binding Lewis acid – triphenylmethylium (TPM) – bound to the rod-like molecule phenylene ethynylene. The phylene ethynlene backbone is rigid enough that the acid cations at either end cannot then bind to the same dendrimer. Instead a polymer chain of dendrimers forms. Using a different starting dendrimer (ZnPG4 instead of DPAG4) - which has a core valency of four instead of two - led to the formation of two dimensional polymerisation of the dendrimers, producing a 2D array of nanocontainers for that can accumulate other Lewis acids into the outer orbitals. The Bohr model of the atom set out by Niels Bohr and Ernest Rutherford in 1913 describes the atom as a positive nucleus surrounded by electrons in different shells or energy levels. Each shell has a prescribed number of electrons that can occupy it - that is, two electrons can occupy the first shell, eight the next, and eighteen the next, and so on. While there are aspects of the atom behavior that the model does not cover, it is particularly successful at explaining the spectral emission lines. When excited, an electron can jump to the next energy level. When it returns to the initial energy level, the difference in the energies is emitted as light at the specific wavelength equivalent to the energy difference. Where a shell is not full, the atom can bond with another chemical species. In this way the valency of an atom describes how full the electron shell is and how readily bonds can form. The electron density gradient of dendrimers moving radially from the core to the more branched outer regions dictates how many Lewis acid coordinating molecules it can accommodate and in this way it mimics the energy levels of the Bohr atom. A Lewis acid is a chemical species that can accept a lone pair of electrons from a chemical that can donate a lone pair, that is, from a Lewis base. This behavior is defined by the electron structure of the chemical. Lewis acids include acidic compounds but also metal cations. When the dendrimer coordinates with the Lewis acids it takes the place of the Lewis base that would donate an electron pair. The researchers describe the di-Lewis acid compound (linker molecule) as electron pair mimicry. When two chemicals react the amount of light absorbed can change depending on how much light the products versus the reactants absorb. If the products and reactants absorb the same amount of light at a particular wavelength, it is described as the isosbestic point. The researchers used isosbestic points to identify the step increases in Lewis acid reacting with the dendrimers. A wavelength shift in the isosbestic point indicates coordination of the Lewis acid to the subsequent layer of the dendrimer.